I first moved here when I was 21 years old. Fresh out of university where I had dedicated three years to learning the language, culture, and history as one of my BA Arts majors. I had Japanese friends in Adelaide, I had watched 'Lost in Translation' three times, I had records by DJ Krush, and read every Geisha book I could lay my hands on. My plan to live in Japan for just a year turned into almost a decade, two half-Japanese kids, and a career in travel and outdoor journalism. I loved the place. Perhaps that's why I chose to stay when the Austrlian embassy called me two days after the 2011 Tohoku Disaster (earthquake, tsunami, Fukushima...) inviting me and my family to return home to Australia on emergency evacuation passenger planes. It took four months before I did make the decision to relocate back to Oz, a move now five years past. But Japan kept calling me back, either for work trips, or for my children to visit their Japanese family and friends, and each time I stepped off a plane at Narita Airport I felt a sense of 'home'. The familiar bows of the airport terminal staff, the ease of sending my bags by courier anywhere across the country for the cost of a small pizza back home, the amazing food offerings, temples, friends, and of course, hi-speed trains and WiFi. Moving back longer term hadn't been on my radar until a month ago. Having sold all our possessions last year and packed our lives into a couple suitcases to spend three months traveling around Colombia with my partner, we certainly had the flexibility of returning to Japan and creating a base for a while when the opportunity arose, which it did. After all, I needed somewhere to store my suitcase full of books. 1. Winter. I'm a surfer who was first posted as an English teacher in an industrialized city called Ota Shi, surrounded by the mountains of Gunma Prefecture. Summer was horrid, but then came winter. I took up snowboarding and fell in love with the White Season. Japan is home to some of the best powder in the world, and ski resorts are much cheaper compared to many international destinations. After riding powder in the trees all day, nothing beats soothing the aching body in an onsen (hot springs). I've just relocated to Hakuba Valley, in Nagano Prefecture, home to the largest ski grounds in Japan and the nation's steepest mountains. Hirauchi Kaichu Onsen. Credit: Angie Davis. 2. Onsen. So I mentioned this above, but onsen is not just a one-off experience. For the Japanese, and me, onsen is a way of life. When I first touched down in Narita last week, I jumped on trains straight to Tokyo to meet my friend and after a delicious vegan feast of soba noodles and tempura vegetables, we jumped on Google Maps and found the closest onsen. There are two types of bath houses you will come across, onsen - volcanic hot springs - and sento - non-volcanic. Many bathhouses across Japan promote the different minerals that make up their volcanic spring water, each with various health benefits. Last year I visited Yakushima for the first time, trekking and SUP paddle boarding with Greenmount Japan, testing out all the local on the island. One of my favourites was Hirauchi Kaichu Onsen, ocean-front volcanic rock pools. This is one of the only onsen where the locals suggest wearing a sarong in the water, due to the number of tourists who visit in peak season. In general, however, you must be naked in an onsen. Drink plenty of water before and after your bathing session! Ain Soph Journey. 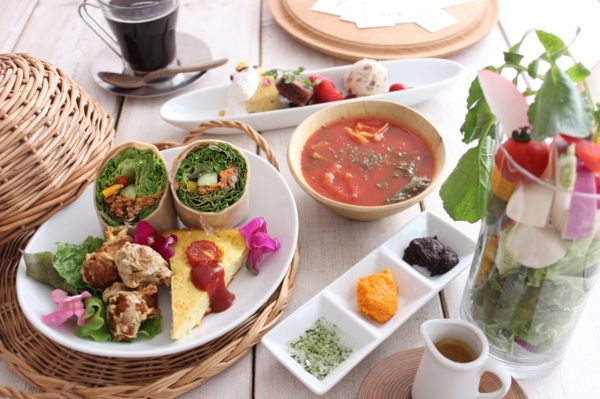 This quaint fine-dining restaurant serves popular Japanese meat dishes, vegan style, and international-inspired cuisine. The mood is stylish, the dishes delicate and pretty. Try the vegan cutlets, karaage, Spanish omlette, and their homemade Chai tea. Ain Soph Ripple. Oh. My. Goodness. Burgers, burritos, soups. All vegan. This is the place to go if you're travelling with non-vegans; they won't know the difference between the plant-based meats and the real deal. Nagi Shokudo. I was staying in Musashi Koyama and a friend knew of the popular vegan cafe Nagi Shokudo, who just happened to have a take-out style bento shopfront walking distance from the apartment. Their soy-meat take on popular Japanese dishes are delicious, and they serve your bento with brown rice and veggie and salad side dishes. The menu changes daily. If you get lucky, try the falafels with vegan dipping sauce. The thing to be careful of when ordering vegan meals at general Japanese restaurants is dashi, a soup stock base used in almost all soups derived from fish flakes. But in general, there are a lot of vegan options in Japan. Soba or udon noodles, tempura vegetables, pickles, rice dishes, tofu dishes...just be careful of the sneaky fish stock! 4. Nature. I mentioned my love affair with snowboarding in Japan. The truth is, that's only skimming the surface when it comes to immersing in nature and outdoor activities here. I have surfed over much of the Pacific Ocean side of Japan, snorkeled in Okinawa, canyoned in Minakami, trekked in Yakushima, and this is still only a portion of what is available. View of Mt Fuji from Fujikawacho. Credit: Angie Davis. Outdoor Japan Adventures is now making it easier for adventure-hungry travelers to find tours and activities all over the country. On my bucket list for the year is surfing in Tanegashima, snowshoe and back country snowboarding in Hakuba, exploring the more unknown temples across the country, taking my kids to meet the snow monkeys in Jigokudani in Nagano, learning permaculture, volunteering in disaster-hit Sendai, and seeing more of the country on foot and bicycle. 5. Affordability. Forget the myth that Japan is an expensive country. It is not. Whether you're coming for a holiday or planning to live here for a year or more, affordability is on your side. Travellers can see much of the country and save a fortune on train fares or road tolls by taking out a JR Rail Pass, giving you unlimited JR rail travel (except the Nozomi train) across the country for a period of 7, 14, or 21 days. Last year I took out the pass and visited Tokyo, Fuji, Kyoto, and Hiroshima all in 7 days. Accommodation and food are just as cheap and you can find great bargains through booking.com or Outdoor Japan. I'm not convinced with Air BnB as yet; prices I have seen advertised seem to exceed what you would pay for more localized hotel or ryokan/pension style traditional accommodation, but do have a look and compare. Be sure to opt for accommodation close to train stations for ease of mobility. If you do want to splurge, then I highly recommend one of the five star hotels in Tokyo. The views over the city are second-to-none. The Mandarin Oriental Tokyo has one of the best located spas I've ever experienced. Mandarin Oriental Hotel Spa, Tokyo. Credit: Angie Davis. If you decide to visit Japan, get in touch. It would be my absolute pleasure in helping you craft the best itinerary for your stay, and pointing you in the right direction for adventure and outdoor tours, cultural experiences, and of course great places to eat. I put together this little Japan teaser video last year to help the JNTO promote the country and I hope to spurs a little Japan envy, enough to get you on a plane to visit this amazing destination.